An apparent gas explosion shook the East Village on Thursday afternoon and sparked a seven-alarm fire that leveled three buildings. 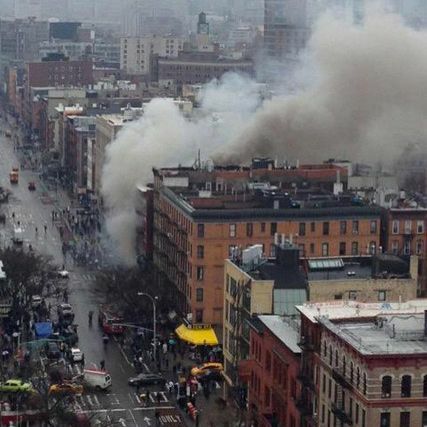 The blast occurred at about 3:17 p.m. in 121 Second Avenue, near Seventh Street. That building was mixed-occupancy, with Sushi Park on the ground level and apartments above. Two other buildings, 119 and 123 Second Avenue, also caught fire and collapsed due to the explosion. Late on Thursday night, firefighters were still battling the blaze in 125 Second Avenue. The FDNY said 19 people were injured in the blast, including five firefighters. Four civilians are in critical condition, and seven suffered minor injuries. Four of the firefighters were hospitalized and one was treated at the scene. At least one person is missing. Nicholas Figueroa, 23, was on a date at Sushi Park and his family said he hasn’t turned up in hospitals or shelters. At a Thursday evening press conference, Mayor de Blasio said that earlier in the afternoon private contractors were performing work on 123 Second Avenue when Con Edison employees arrived to see if the property was eligible for a gas upgrade. ConEd spokesperson Michael S. Clendenin told the New York Times that workers had begun renovations on 121 and 123 Second Avenue back in August. “Based on records here, the building has had some work done inside; new gas service pipes; a lot of things; piping and such,” Clendenin said. The work being done on Thursday failed the inspection, and ConEd gave the contractors instructions on how to fix it so that the gas work could be performed. An hour or so later, the building exploded. No reports of a gas leak had been called in prior to the explosion. One Facebook user named Blake Farber posted a video and detailed description of the scene, claiming he walked by and smelled gas just before the explosion. Witnesses said the apparent gas explosion “felt like an earthquake” and shook the building before it erupted into flames. They described people running away from the building after the explosion, some bleeding from their heads and hands. Writer Scott Westerfeld reported that he heard a “very loud boom” that set off car alarms. “Civilians were helping people out from wreckage blown across the street,” he tweeted. Joanie Educate, an NYU student who was evacuated from her dorm, describes the scene to Bedford and Bowery in the video below. “They were dragging people out of it all covered in dust and stuff and they were puking,” she says. He made it back down just as heavy smoke began streaming out of the building. Flames were visible on the first floor as fire engines arrived on the scene. Smoke from the fire could be seen and smelled across Manhattan and as far as other boroughs. The fire department advised city residents to keep their windows closed to prevent smoke from entering their homes. On Thursday night firefighters were still battling the fire, though no flames were visible. Over the course of the day more than 250 firefighters were on the scene. Pommes Frites, the Belgian fry restaurant located at 123 Second Avenue, thanked first responders for “immediately helping the injured and containing the fire.” They said their staff and customers were unharmed, and they hope to reopen someday. Several area businesses offered to help those affected by the fire, including Uber and the Standard, East Village, which offered residents of the collapsed buildings a complimentary three-night stay.